I want to say thank you for dipping your toes back in the climate waters again. Also, I’m sorry about the treatment you’ve received over the years, and continue to receive. I watched your recent testimony and nearly fell out of my chair when Mann said you were using outdated information. His treatment of Dr. Curry, and subsequent denial of that treatment when it was fully on display is something which still amazes me. What I don’t understand is why people refuse to call out Mann on his boorish behavior and why people continue to support him even when he’s clearly and demonstrably wrong on many of the things he says. I don’t require or expect a reply. I just want you to know that the whole world is not like Michael Mann and there are people who respect what you have to say in regard to climate and climate science, despite what it may feel like some days. Your climate blog is missed. Science is supposed to be about induction, reasoning from observation, experimentation, etc. to conclusions. Debate is supposed to be about whether the methodology is applied correctly. If it is, then the conclusions are true. If not, conclusions are rejected. Leftists have tried to make science deductive, as in, conclusion oriented. Championed by Stalin’s pet scientist Trofim Denisovich Lysenko, debate is centered on whether proposed conclusions are acceptable to a specific ideological outlook. If politically correct, conclusions are accepted. If not, then conclusions are rejected and their proponents silenced — permanently. In the former Soviet Union, dissenting scientists were sent to the Gulag. In the U.S., leftists have to go through the motions of inductive research and settle for character assassination and/or legal harassment. I do know I will never donate to my university as long as Mann is there. Due to fear of being sued for libel from him, I will leave it at that. Go Lions! It has been a long time since Michael Mann has done any real science, as he went down the far-left political rabbit hole many years ago. … and exactly what was that occasion when he actually real science? I realise that you and Michael Mann have an ongoing conflict, but comments like this are clearly nonsense and it would be nice to at least see you challenging this kind of stuff (each to their own, of course). Maybe you haven’t had a chance, so to save you the time I will simply point out that it’s utter nonsense to suggest that it’s been a long time since Michael Mann has done any real science. You just need to look at his publication record (which is not hard to fine) to see this. As did foreign policy, environmental policy, immigration policy, and DOJ policy. Your point is getting lost in all the crashing and burning. Well, nyah! I predicted you’d be back just after the Nate Bronze thing, and it’s because, even though you’re a progressive and somewhat sympathetic to some of the political urges of the alarmists, you’ve got a very acute understanding, felt deeply in the welts in your flesh, of the fundamental disconnect between the alarmist narrative and reality. Please stick around, the fun has just begun. of global economic growth, which still dependent on energy, implies some acceleration of CO2 emissions. Rheinhart and Rogoff declared that ‘debt overhang’ from financial crises took about a decade to resolve, which would be consistent with accelerated growth. At the same time, each year, more and more countries are exhibiting declining working age populations. China has reached that situation now. Given the macro level relationship that economic growth is a function of population growth and productivity, the only way for economies to increase growth is to become more productive. And given that productivity tends to correspond with energy efficiency, it seems that both population and intensity argue for continuation of restrained emissions from secular factors. 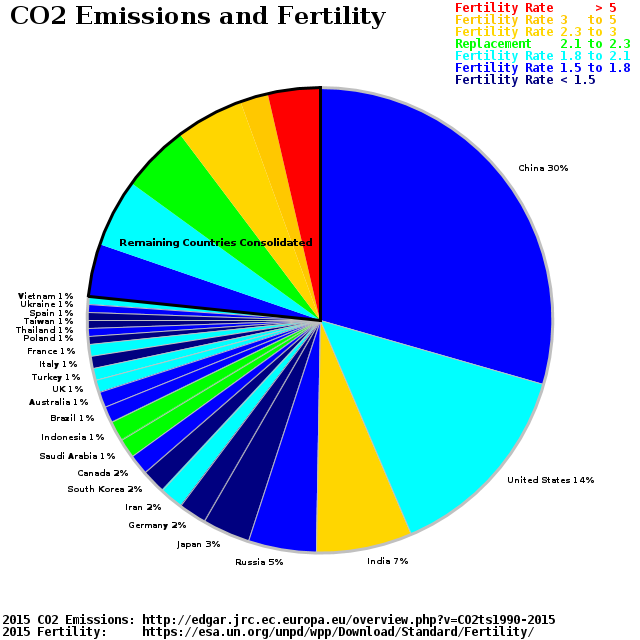 Related is this graphic of CO2 emissions by country, color coded for total fertility rate. Some points of your article really made me laugh, a highlight in this depressing CAGW tragedy. But probably humor is the best weapon in this hopeles discussion. And that’s it , folks! Roger, welcome back. I also am glad to see you writing again on climate change issues. Hope you do more policy posts. Totally agree on the need for a more robust policy that will continue no matter which side is in office — and on the huge mistake it has been to politicize science. I also agree with others that it’s good to see your perspective again, even if not very often. Regarding the first two figures, I think if you put them on the same scale you will see that the estimated effects of the Clean Power Plan are similar to the effects of energy prices, not far less. Pingback: Weekly Climate and Energy News Roundup #272 | Watts Up With That?